You, like many entrepreneurs, may have found that one of your most effective marketing tools is a speaking engagement in front of your ideal prospects. Speaking gigs provide the prospects a chance to see you in action, sample your expertise, and fall madly in love with what you have to offer. That’s why it’s crucial that you don’t waste these golden opportunities by making easy-to-avoid presentation mistakes. Here’s a checklist of what NOT to do when speaking to an important group. These first six blunders fall into the area of making the presentation all about you, rather than your audience. Mistake #1: Talk AT your listeners. Your audience is already dealing with information overload. The last thing they need from you is a relentless data dump. Solution #1: Engage your audience members. Effective communication is a two-way street. Make sure both lanes are free and open. Solution #2: Act as a facilitator of learning and a resource for information. This is sometimes referred to as being “the guide on the side”. An effective speaker not only shares new information; she also relates it to the listener’s existing knowledge and demonstrates how the new knowledge can be applied to challenges. Preparation + flexibility + proper focus = value for your audience. Mistake #3: Act as if you’re the only one with expertise in the topic. This is yet another variation of making it all about you. The speaker lacking in confidence is unlikely to be willing to solicit input and ideas from audience members, thinking that she’ll look bad by comparison. In fact, the opposite typically happens: audience members are more engaged and respectful of the speaker’s expertise if she doesn’t come across as a know-it-all. Solution #3: Tap audience members for their ideas and expertise. If you’re a confident and service-oriented speaker, you’ll tap audience members as additional sources of wisdom and good ideas. Not only does this improve your own knowledge base for future presentations, but it makes the current audience favorably view your authenticity and commitment to providing value. Mistake #4: Keep to yourself before and after you speak. Yes, it’s tempting to grab a few extra minutes for some solo pumping-up time. Not, it’s not a good idea to hold yourself aloof from your audience, either before or after your presentation. Solution #4: Start making emotional connections as soon as the first person walks in the door. The more easily your listeners can see you as a real person with real vulnerabilities as well as real skills, the easier it will be for them to decide to hire you. Mistake #5: Turn your presentation into a thinly veiled sales talk. Nobody likes to feel they’ve had a bait-and-switch done on them. Act with integrity: Give them the meaty content they’ve been led to expect, and don’t imply that using your programs and products is the only way listeners can fully benefit. Solution #5: Do an explicit promotion as dessert, not as the main course. Once you’ve over-delivered on providing relevant, high-value content, you’ll have earned the right to basically say, “If you liked this, you’ll love the more in-depth services I offer.” And at that point, your audience will be eager to hear it. Mistake #6: Share success stories (i.e., case studies) where you are the star. You, like every entrepreneur, have accomplished some really noteworthy things. However, if every single story you tells casts yourself as the hero, you’re likely to turn off your listeners rather than engage them. Solution #6: Share success stories which star your clients. Not only does this approach avoid making you sound smug and full of yourself; it’s another powerful way to demonstrate the value of what you bring to your clients. If you just can’t resist sharing a story in which you play the leading role, make it a story of a painful lesson learned as the result of some screw-up on your part. This will show your fallibility and make you feel far more approachable. These next three no-no’s have to do with lack of flexibility. Mistake #7: Fail to relate your topic to the day-to-day challenges your listeners face. Knowledge provided in a bubble is pretty useless. If you don’t make the effort to relate what you’re saying to what your audience is facing, the chances of you being invited back to speak again are very, very small. Solution #7: Tailor your content to the current situations and needs of your audience. All audiences (and prospects) want to know, “What’s in it for me?” The more clearly you show how your information can be used to address their current challenges, the more effective your message…and the more powerful your demonstration of just how you can make their lives better. Mistake #8: Not customizing your information. It remains true that a “one size fits all” approach is a fast way to destroy your credibility. While you can’t tailor a presentation to every single individual’s needs, you can avoid the trap of making “canned” presentations that never vary, no matter who the audience is. Solution #8: Do your research and learn about your audiences so you can use examples each audience can relate to, while keeping your core message the same. This is easy enough to do when preparing your presentation. The event organizer is likely to be a good source of information about the listeners’ backgrounds, needs, and challenges. With forethought and planning, you can readily incorporate this information into your presentation and learning activities. What are examples of horrible presentations you’ve sat through? What could the presenter have done to made them worth your while? Share your thoughts in the Comments section below and, as a thank you, I’ll send you a no-charge copy of Seductive Marketing: Answer These Five Questions to Entice Your Readers. This entry was posted in professional skills and tagged effectiveness. Bookmark the permalink. Hi Kathleen!! 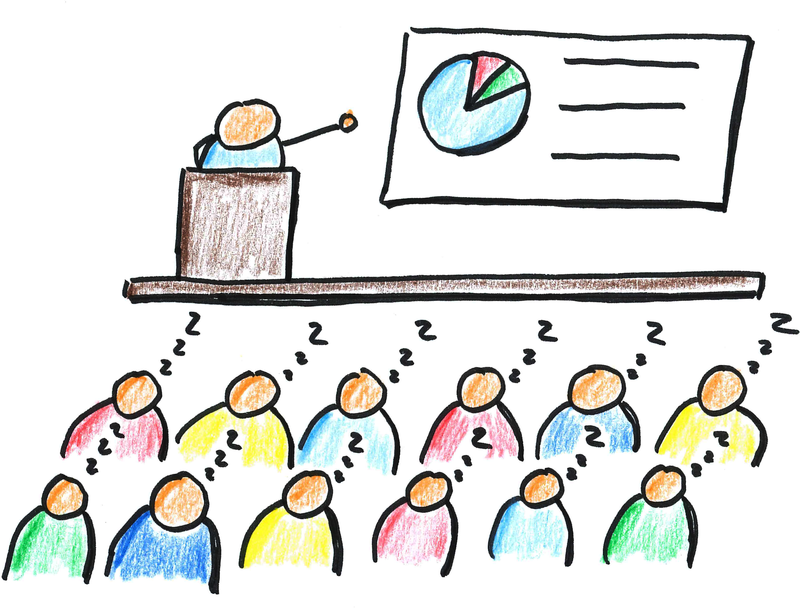 Soooo…., very recently, I sat through a boring presentation where a PowerPoint presentation was the center-of-attention. At first, that was working for the presenter, but it soon became obvious that his role was mostly just reading what we, the audience, could already see and read (even faster). He rarely turned around, and when he did, he made eye contact only to a few people in the front middle section. Many of us felt disconnected. What could he have done? Quite frankly, you nailed it in your list of eight mistakes to not make, and he certainly could have at least added a Q&A at the end, even though some interaction throughout his presentation would have made it much more interesting. And, thank you, in advance, for sending your “Seductive Marketing: Answer These Five Questions to Entice Your Readers” to me. Yikes! A classic Death By PowerPoint. I didn’t think there were that many of those still out there; bummer that you had to run into one of them. 🙁 One hopes the next presentation you go to more than makes up for this one. Have fun with the Seductive Marketing exercise. I suspect you’re already answering most of the questions, but I also suspect you’ll get at least a couple of ideas on new ways to spin your copy. Enjoy! Kathleen, what a great checklist of no-no’s! Good to see them as both audience and speaker. Thanks for great content, as always. Third time I heard Richard Louv at a conference (Last Child In The Woods). The same basic talk I heard two other times, hands in pocket, rambling and off task, lots of “me” stories, mumbling. The Outdoor Writers Association of America paid him big bucks to talk. Disappointment is a mellow word for the result.